Can’t make it next week to the SVG Summit in New York? This year’s keynotes, case studies, and panels taking place on Tuesday, Dec. 11 will be streamed live, beginning 8:30 a.m. ET and going all day until 4 pm ET. This year’s Day Two General Sessions include keynote conversations with NBC Broadcasting & Sports Chairman Mark Lazarus and Alliance of American Football Founder Charlie Ebersol. More than 1,500 of your colleagues are already registered to attend our association’s largest annual meeting– a new SVG record. Can’t make the Summit this year? While you will have to be in attendance in NYC to participate in the Day 1 workshops, networking events, and technology demos, you can still join the Day 2 main stage sessions from your desktop or mobile device. The SVG Summit Day 2 livestream will be available HERE beginning at 8:30 a.m. ET on Tuesday, Dec. 11. Simply bookmark or share this link with others to check out all the sessions at the biggest annual event in sports-production. SVG will also be sharing real-time highlight clips from the main stage all throughout the day on Tuesday over on Twitter @sportsvideo. 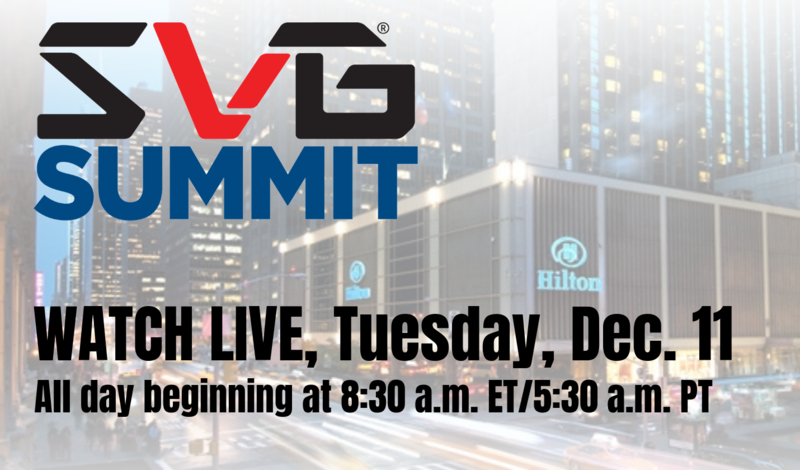 Join the conversation using #SVGSummit.